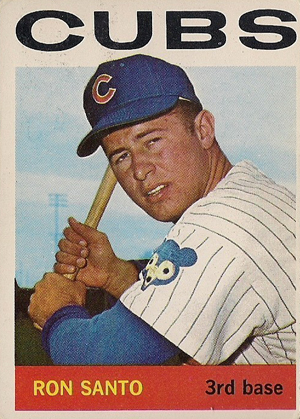 Finally, Ron Santo can officially be called a Hall of Famer. One of the greatest third basemen of all-time, Santo was overlooked for many years. A standout with both the bat and the glove, Santo's journey to Cooperstown wasn't easy. Many argue it came too late. 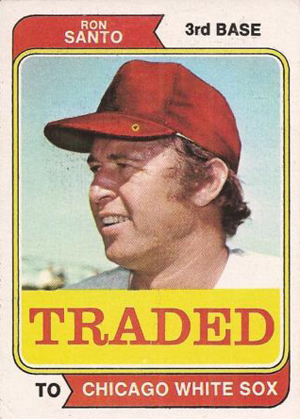 And while Ron Santo cards may not hold the same place among collectors as Mickey Mantle, or even other Cubs legends like Ernie Banks and Ryne Sandberg, it's still worth looking back at the cardboard career of a Chicago great. 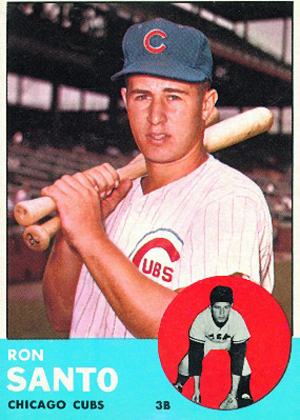 Shop for Ron Santo cards and memorabilia on Amazon. 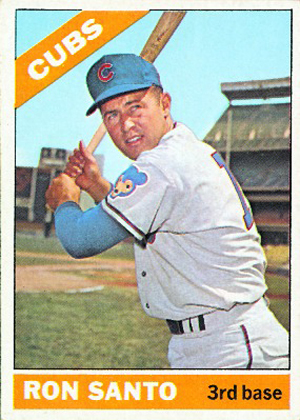 Santo signed with the Chicago Cubs in 1959 and debuted with the team the following season. 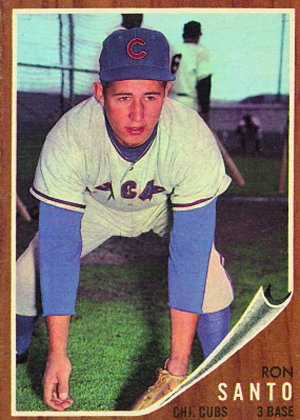 Within a couple of years, he had established himself as a premier player in the field, winning five straight Gold Gloves between 1964 and 1968. At the plate, he was also very strong. Santo hit 20 or more home runs in a season 11 times. He was just the second third baseman to hit 300 homers in his career. Santo also drove in 80 or more runs 11 times. 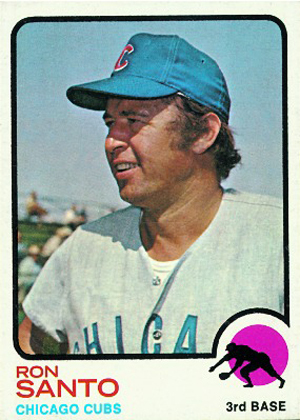 The five-time All-Star finished his playing career across town with the Chicago White Sox. 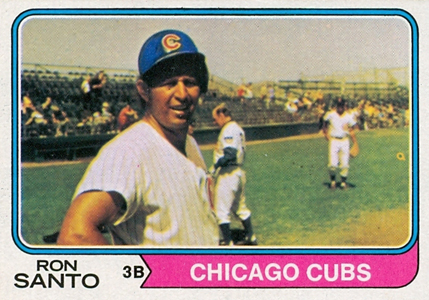 However, Santo will always be remembered as a Cub. He would later cover the team as a radio color commentator with WGN beginning in 1990. 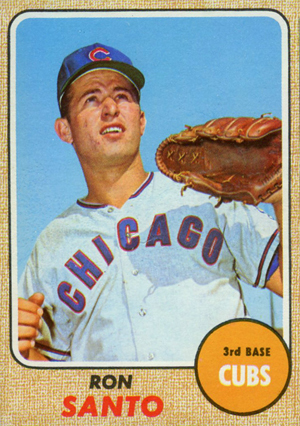 The Cubs legend played much of his career without revealing that he has diabetes. He didn't make it public until 1971. In 2003, Santo became just the third Cubs player to have his number retired by the team. Sadly, Santo passed away in December, 2010. Despite being one of the best at his position for several years, Santo struggled to gain the respect of Hall of Fame voters. During his first year of eligibility, he got so few votes that he was taken off the ballot. Santo was later put back on following rule changes and a groundswell of support. Still, that wasn't enough. Santo was finally elected for the 2012 Cooperstown class by Veterans Committee. 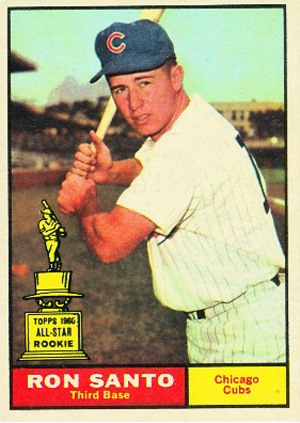 Ron Santo rookie cards can be found in 1961 Topps Baseball. It should be considered a bargain, widely available in solid condition for $30 or less. 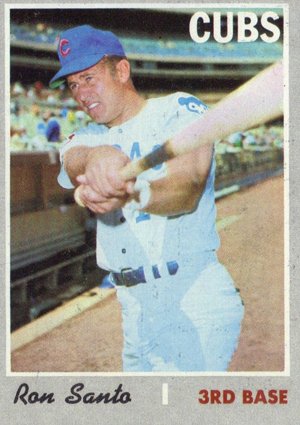 Santo was also featured in the 1961 Topps Stamps insert set. 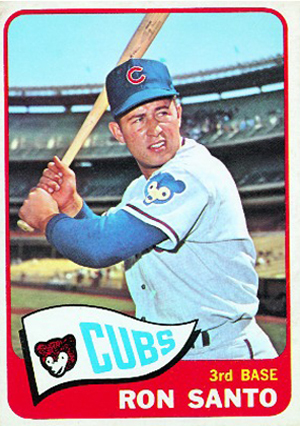 The 1961 Post Ron Santo is another bargain. 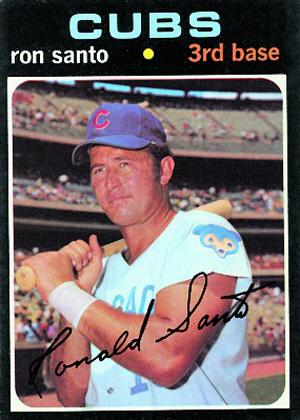 Collectors also have lots of options for autographed Ron Santo cards. He was a regular signer for several companies, particularly between 2001 and 2005. 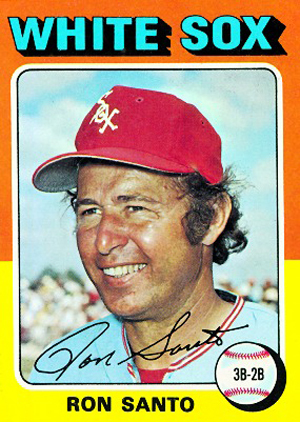 Many mid-range Ron Santo autographs can still be found for under $40. 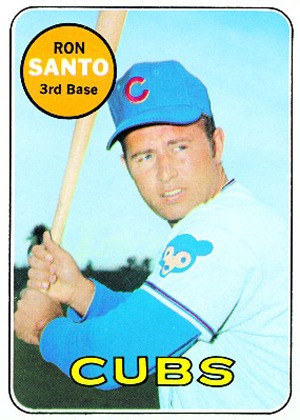 Here is a complete run of Topps Ron Santo cards from his playing days.